What do retired National Football League players do after leaving the field? These athletes stay in the public eye- volunteering, lending their name and brand to different nonprofits and charities, raising monies that benefit their loved ones and community…doing outreach and giving back is the biggest part of being in the NFL, and their prestigious brotherhood of retirees. Retiring before you are forty leaves an expanse of time to be filled with making dreams reality, and retooling oneself for after the last tackle. 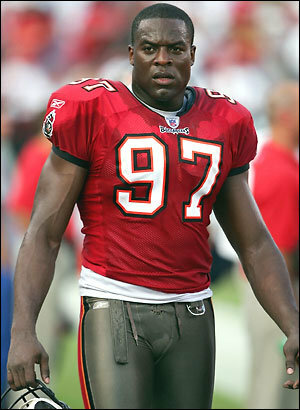 Simeon Rice has played football for the majority of his life- whether in high school, college, in the NFL, or for the United Football League, Rice has had his cleats and game face on. Simeon, like all athletes, has many sides. Rice has a passion to create art and expose societal issues. A natural satirist, Simeon is at ease discussing his career and goals. In 2010 Simeon made the decision to pursue his other love- the entire entertainment industry. Rice completed the 4-week and 8-week filmmaking workshops at the New York Film Academy (in Los Angeles). While attending Rice wrote, directed, acted, produced and edited his work. Simeon created relationships with his classmates and collaborated on multiple films. Simeon has evolved- he is now a Hollywood Director, Producer and Screenplay Writer. NYFA had the opportunity to watch Executive Producer Rice’s first Short film When I Was King. Simeon channels TechCrunch and Mashable’s hot topics into his film- primarily discussing the fundamental problems men and women have using social media sites for recreational purposes. Unlike the movie Social Network, Simeon’s character Frank (Dolph Paulsen) is influenced by the bantering of single friends- and embraces his new freedom (by assuming that his fiance had walked away from their lives together, he needed to learn how to Facebook women and get action off of MySpace). This comedic interpretation of social medias use to find a flings primary goal is to teach online safety practices; Frank had little online networking experience. He is depicted as a 25 year old man without a Facebook, Twitter, MySpace, LinkedIn or FourSquare presence…we know, he is an anomaly?! When I Was King makes the techno-savvy individual second guess; Simeon pushes the viewer to ask: Is being tied to so many through online friend requests dangerous? Am I providing too much information, eliminating the dating and friendship processes? NYFA Alum Stormi Henley Makes it to Hollywood on American Idol!! !